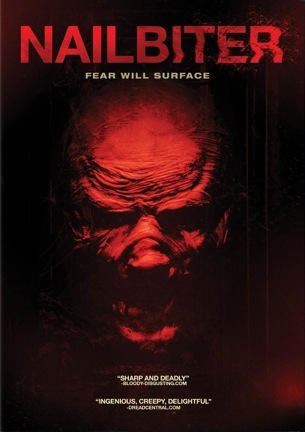 A mother and her three daughters find themselves trapped in a storm cellar by strange creatures after taking refuge from a tornado. Recovering alcoholic Janet Maguire prepares for a trip to the Kansas City airport to pick up her returning military husband. Along for the ride are Janet’s three daughters: Jennifer, Sally, and Alice. On the way, the ladies stop at the Clinton Store where they are warned by Deputy Carr about the coming storm. Ignoring the warnings, the Maguire women continue on their way until the approaching twister forces them to abandon their car in the town of Wellsville, Kansas. They find a nearby storm cellar that appears abandoned and they take refuge. When the storm passes, the women discover that a fallen tree has blocked the cellar doors, preventing them from leaving. Sally tries to climb out a cellar window but she is bitten on her arm by something outside. Her mother and sisters treat her wound as Sally begins to go unconscious. Jennifer tries to use her phone but cannot acquire a connection. Instead, she sends text messages to her father reporting on their situation. The girls eventually realize that they are being kept in the cellar intentionally when all of the windows are suddenly boarded up from the outside. Deputy Carr notices the Maguire car by the side of the road. He inquires about their whereabouts at the nearby home of elderly Mrs. Shurman. Mrs. Shurman claims to know nothing about the missing women and she is joined by one of her sons, who is also the local sheriff. Carr leaves but looks around the perimeter and discovers the women trapped in the cellar. He tries to help them escape but he is pulled away and killed by an unseen creature. Alice discovers newspapers and a diary in the cellar. It is revealed that the Shurman family has a history of giving birth to creatures when the women go into labor during a storm. Jennifer sends more text messages to her father. The ladies discover a secret passage that leads to a moonshine distillery. Alice points out the propane tank on the still. While Janet and Jennifer work to carry the still back to the cellar door, Alice stays with her sister Sally. Something comes through a large pipe and pulls Alice away, leaving her cracked glasses on the floor. Janet mourns the loss of her daughter when she returns with the still. Janet and Jennifer then build a powerful nail gun. A monster slashes at Janet before Jennifer is able to shoot it with nails and beat it to death. Janet uses the propane tank and a Molotov cocktail to blow open the cellar door, but the blast kills her. Jennifer and Sally escape the cellar and Jennifer uses the nail gun to fight off another creature. The two remaining sisters make their way to another home where they discover that the family there belongs to the same race of storm creatures as the Shurmans. Sally is attacked while Jennifer makes it outside, only to be confronted by a large group of townspeople. After pretending to consider suicide, Jennifer shoots Mrs. Shurman with a gun. The townspeople begin shapeshifting as the storm siren sounds. Jennifer hides in a truck where she is attacked as another storm strikes. In the morning, the sheriff and another man survey the storm wreckage and realize that there is no sign of Jennifer. Meanwhile, Lt. Maguire arrives at the airport and reads the text messages from Jennifer that wait on his phone. Far from living up to its title, “Nailbiter” is what a horror movie would be like if Lifetime stopped doing Meredith Baxter domestic violence dramas and dipped its toes into genre cinema. Rated R for reasons unknown, “Nailbiter” is tame enough for daytime television, but not even as entertaining. The quad of women that anchor the story have characterizations so thin that they disappear when turned sideways. Janet Maguire is a recovering alcoholic. The extent of this depiction is an introductory scene at an AA meeting and a moment later in the film when she briefly cradles a bottle of scotch. Meg Saricks, who resembles a younger Shawnee Smith, plays Janet’s eldest daughter Jennifer. Jennifer has a bit of a smarmy “bad girl” streak, evidenced by the fact that she smokes cigarettes. Alice is the brainy daughter. This is easy to tell because she is shy, quiet, and wears glasses. Rounding out the trio of daughters is Sally. Sally’s defining trait is dead weight. She suffers a bite on her forearm early in the story and inexplicably passes out, having to be carried around for the remainder of the movie. 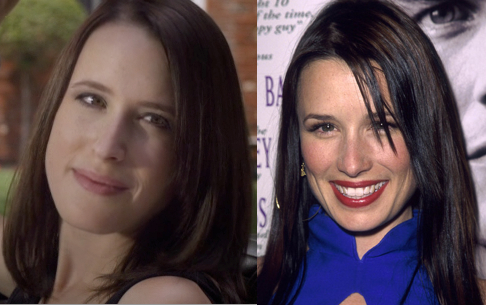 Meg Saricks and Shawnee Smith: Separated at birth? Ignoring the blaring sirens, buzzing emergency alerts, verbal warnings, and incessant sounds of residents boarding up windows to prepare for the coming storm, the Maguire family decides that a tornado is not enough of a deterrent to impede their plan to pick up Lt. Maguire, Janet’s husband, at the Kansas City airport. They make it as far as the town of Wellsville when the approaching twister forces them to take refuge in a nearby storm cellar. The cyclone is soon to be a distant threat when they realize that they are not alone in the cellar, and whoever owns the home is not about to let the women leave alive. Take a good look at the DVD cover, because that is the best shot there is of the creatures that stalk the Maguire girls. (Although the monster on the box is not even the one that is in the movie.) The FX department seems to have had only enough foam and latex to create a face, one hand, and a small back piece. With the exception of a singular bullet to a forehead, all of the kills happen offscreen as well, in keeping with the film’s goal of concealing every element that might be of interest to horror fans. Stranger than the decision to hide the carnage and the creature to the point of annoyance, is the film’s feeling of being a neutered stage play. Director Patrick Rea and cinematographer Hanuman Brown-Eagle appear to forget that a camera can tilt up and down or pan left and right. So many scenes are staged with stationary shots that intended drama plays out as stilted. The camera is merely recording movements instead of flowing with the action or adding suspense. A pair of crane shots shows that they had a budget for camera production, but the cellar scenes are flat and lifeless, devoid of visuals that are either creative or interesting. Completing the TV movie feel is a soundtrack fitting for a Disney movie. Scenes feature puzzling orchestral melodies and chime-like vignettes that feel like they should accompany magic wands waving arcs of sparkling stars as opposed to anything taking place in a horror film. It is as if the score from a completely different movie was accidentally laid over “Nailbiter” instead. Having fallen down on the technical front, “Nailbiter” has only its story to rely upon as a saving grace. Except that the movie is a letdown in this department, as well. For a film that has enough endings to rival “Return of the King,” “Nailbiter” rolls the final credits without ever offering a satisfying explanation for the tepid events. A family caught in a storm cellar while pursued by mysterious creatures should inspire fear, panic, paranoia, and claustrophobia. Instead, “Nailbiter” inspires yawns, heavy eyelids, and a feeling that the time would have been better spent watching something else entirely. June 1, 2013 by Ian Sedensky.